For many years I have had a subscription to the Paper Mill Playhouse. Our season tickets are always for Friday night performances. As such, it is frankly a bit of a chore to come home from work at the end of the week and immediately hustle off to the theater. However, in all the years I have been schlepping to the theater on Fridays, I can count the times on one hand that I wasn’t glad I went. Last night was no exception. It was hot; I was tired, and I would have preferred a seat on the deck with a cold drink. But, off to the theater we schlepped. Last night was also no exception in that I am particularly glad I went. The show was “Hello, Dolly!” and it was excellent. “Dolly” was played by Tovah Feldshuh, an extremely talented woman of many voices, all of them wonderful. The supporting characters were also terrific. There aren’t many things quite as impressive as an entire ensemble facing the audience and singing full out, and “Hello, Dolly!” provided lots of that and some first-class hoofing as well. 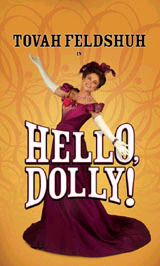 Should you live anywhere near the Paper Mill Playhouse (Millburn, NJ), I urge you to see “Hello, Dolly!”. You won’t be disappointed.